HAVANA TIMES — Forget South Florida politics, negotiate with the Cubans and find a way to bring Alan Gross home. That’s what Judy Gross told me earlier this week. But perhaps most unexpected has been the sudden rise of the Cuban church as the first and only alternative institution to the Cuban revolution. In fact, a half century after Fidel banished thousands of priests and nuns from the island, the rebounded Catholic Church is arguably the one non-communist entity in Cuba that Raúl trusts today. All of which makes a move by U.S. Secretary of State John Kerry last week seem smart. During a stop in Rome, Kerry announced he’s asked the Vatican to help negotiate the release of Gross, the 64-year-old State Department contractor who just finished four years of a 15-year prison term in Cuba for subversion. Feature continues here: Alan Gross And The Vatican: Could The Keys Of St. Peter Unlock A Cuban Jail Cell? Secretary of State John Kerry on Tuesday called on the Vatican to help secure the release of an American contractor who has been jailed in Cuba for nearly five years. “I raised the issue of Alan Gross and his captivity, and we hope very much that there might be able to be assistance with respect to that issue,” Kerry said. Gross, 64, was arrested in late 2009, after being accused of smuggling sophisticated satellite and other telecommunications equipment to Cuba’s tiny Jewish community. Gross has said he was only trying to increase internet access in Cuba. But he was convicted by a Cuban court in March 2011 of crimes “against the independence and territorial integrity of the state” and sentenced to 15 years behind bars. 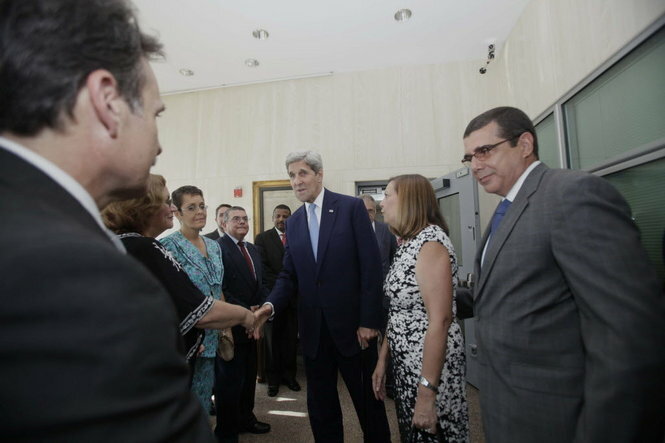 Cuba deems the U.S.-backed technological program subversive. The arrest hampered a brief and historically unusual period of detente in U.S.-Cuba relations after President Barack Obama took office and promptly eased restrictions on travel and remittances to the island for Cuban-Americans with family in Communist Cuba. Kerry — the first Catholic U.S. secretary of state in more than three decades — visited the Vatican en route to Kuwait to hold talks with a top aide to Pope Francis: Secretary of State Archbishop Pietro Parolin. The Vatican has relatively healthy diplomatic ties to Cuba. Pope Francis’ predecessors — Pope Benedict and the late Pope John Paul — both made historic voyages to the country. The Obama administration is “currently engaged” in behind-the-scenes discussions to win the release of U.S. government subcontractor Alan Gross, jailed in Cuba for the past four years, according to Secretary of State John Kerry. Kerry, who engaged in another secret effort to free Gross in 2010, made the largely unnoticed remarks Tuesday at a news conference in NATO headquarters in Belgium, after he was asked about U.S. citizens detained in Cuba, Iran and North Korea. “In the case of Mr. Gross, we’ve had any number of initiatives and outreaches over the last several years and engagement with a number of different individuals who have traveled to Cuba, met with people individually there and elsewhere,” Kerry said. “And we are currently engaged in some discussions regarding that, which I’m not at liberty to go into in any kind of detail,” he added, declining further comment on a case that has become the key roadblock to improved U.S.-Cuba relations. “With respect to the number of American citizens who are being held in different places …we have been engaged behind the scenes — which is often the way these issues are best managed — in every single case in order to try to secure the safety of those people, and in order ultimately to be able to secure their release,” he said. The State Department did not immediately reply to El Nuevo Herald request for an explanation of the secretary’s remarks. Kerry did not identify the other party or parties in the “discussions” to free Gross, 64, a Maryland development specialist man serving a 15-yerar prison sentence in Havana for delivering sophisticated communications equipment to Cuban Jews. He was convicted of endangering the island’s national security because the equipment was paid for by the U.S. Agency for International Development as part of a pro-democracy program. The Cuban government regards the USAID programs as part of an effort to undermine and even topple its communist system. Popular support growing for end to embargo, diplomatic stalemate dating to 1959. HAVANA, Cuba — They’ve hardly become allies, but Cuba and the U.S. have taken some baby steps toward rapprochement in recent weeks that have people on this island and in Washington wondering if a breakthrough in relations could be just over the horizon. Skeptics caution the Cold War enemies have been here many times before, only to fall back into old recriminations but there are signs that views might be shifting on both sides of the Florida Straits. The countries have held talks in the past week on resuming direct mail service, and announced a July 17 meeting on migration issues. A U.S. federal judge in May allowed a convicted Cuban intelligence agent to return to the island. Cuba informed the family of jailed U.S. government subcontractor Alan Gross this month it would let an American doctor examine him, although the visit has apparently not yet happened. Cuban President Raul Castro has also ushered in a series of economic and social changes, including making it easier for Cubans to travel off the island. Under the radar, diplomats on both sides describe a sea change in the tone of their dealings. Only last year, Cuban state television was broadcasting grainy footage of American diplomats meeting with dissidents on Havana streets and publicly accusing them of being CIA frontmen. Today, U.S. diplomats in Havana and Cuban Foreign Ministry officials have easy contact, even sharing home phone numbers. Josefina Vidal, Cuba’s top diplomat for North American affairs, recently travelled to Washington and met twice with State Department officials, a visit that came right before the announcements of resumptions in the two sets of bilateral talks that had been suspended for more than two years. Washington has also granted visas to prominent Cuban officials, including the daughter of Cuba’s president. Among the things that have changed, John Kerry has taken over as U.S. secretary of state after being an outspoken critic of Washington’s policy on Cuba while in the Senate. U.S. President Barack Obama no longer has re-election concerns while dealing with the Cuban-American electorate in Florida, where there are also indications of a warming attitude to negotiating with Cuba. Of all the components to the United States hostile strategy against Cuba, nothing raises the ire of the Castro government more than its inclusion on the State Department’s list of states that sponsor terrorism. The designation is seen by Havana as an impediment towards improving relations and as a cruel hypocrisy that provides political cover for Washington to justify the imposition of economic penalties along with the perpetuation of anti-revolutionary propaganda. The history of Cuba’s controversial inclusion goes back to 1982, the same year Iraq was taken off the list by the Reagan administration. Besides Cuba, only Sudan, Iran, and Syria continue to be labeled as state sponsors of terrorism. North Korea was dropped in 2008, while Pakistan, long the home of Osama Bin Laden and recognized as a haven for Islamic terrorists, has never been considered. Saudi Arabia, where the majority of the 9/11 terrorists came from, is looked upon as a staunch ally of the United States. There are numerous reasons why the Castro government finds its insertion on the list so galling. First are the real economic consequences to the designation. By law the United States must oppose any loans to Cuba by the World Bank or other international lending institutions. Obama administration officials have been using Cuba’s inclusion to make it increasingly difficult for Havana to conduct normal banking transactions that involve U.S. financial establishments, regardless of which currency is being used. Furthermore, the United States has imposed an arms embargo against all parties placed on the list (which the Castro government has experienced since the triumph of the Revolution) as well as prohibiting sales of items that could be considered to have both military and non-military dual use, including hospital equipment. For example, the William Soler children’s hospital in Havana was labeled a ‘denied hospital’ in 2007 by the State Department, bringing with it serious ramifications. Various medicines and technology have become impossible to obtain, resulting in the deaths of children and the inability of staff to properly deal with a variety of treatable conditions. For Cuba, these restrictions are additionally damaging as the island continues to suffer from the comprehensive embargo the United States has imposed since the early 1960s. On an emotional level, Havana has long drawn attention to the double standard that permits Washington to label others as a terrorist state, all the while ignoring its own culpability in the multiple acts of terror that have been responsible for the deaths of thousands of innocent Cuban civilians. This relatively unreported history stretches back to the early months following Castro’s victory over the Batista regime, when the United States was determined to eliminate the Cuban revolution not only through economic and political means, but with violence. Operation Mongoose, a program developed by the State Department under the overarching Cuba Project, coordinated terrorist operations from the period following the failed Bay of Pigs invasion in April 1961 to the October missile crisis 18 months later. During this time State Department officials provided logistical and material support to violent anti-revolutionary groups carrying out terrorist activities on the island. The terrors included torturing and murdering students who were teaching farmers to read and write, blowing up shoppers at Havana’s busiest department stores, bombing sugar cane plantations and tobacco fields, killing Cuban fishermen and the innumerable attempts to assassinate Fidel Castro and other top government officials. Historian Arthur Schlesinger reported in his biography of Robert Kennedy that Operation Mongoose was formulated under the Kennedy administration to bring “the terrors of the earth” to the Cuban people. It has been called one of the worst cases of state sponsored terrorism of the 20th century. When Operation Mongoose ended, violent anti-Castro groups based in South Florida, such as Alpha 66 and Omega 7, took over operations, often with the tacit approval and knowledge of local and federal authorities. In 1971, the village of Boca De Samá on the northeast coast of Cuba was attacked, leaving two civilians dead and a dozen more injured. Alpha 66 continues to claim credit for this act of terrorism on their website. A series of biological agents were purportedly introduced into Cuba in the 1970s, harming a number of plants and animals. These biological attacks included an outbreak of swine fever that killed a half-million pigs. Perhaps the worst case was the1981 epidemic of Dengue 2, totally unheard of in Cuba prior to this period. More than 300,000 people were affected within a six-month period. An estimated 102 children died as a result of the disease. Cuban-American Eduardo Arocena, former member of Omega 7, testified in 1984 that he travelled to Cuba in 1980 to “introduce some germs” into the country to “start the chemical war,” —as reported by The New York Times. One of them was Dengue 2.